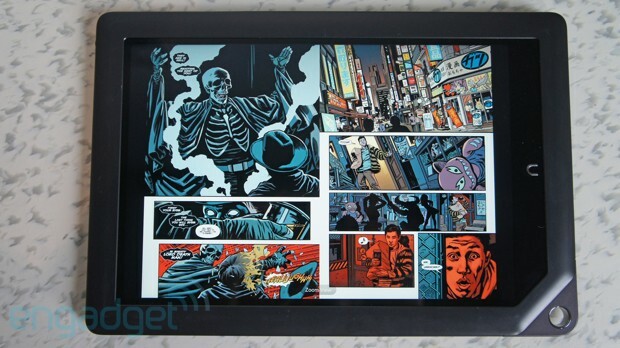 A couple of weeks back, we referred to the Nook HD as a "tablet with the heart of a reader." And given Barnes & Noble's roots in brick-and-mortar bookstores, the sentiment makes sense; the company has given the world a product that felt a bit like an LCD reader with some solid tricks up its sleeve. While it shares the same core operating system as the HD, the HD+ brings a bit more to the hardware party -- namely, a high-def, 9-inch HD display. The change shifts some of the product's focus toward multimedia, with a particular emphasis on the recently announced Nook Video service. That, coupled with a $269 price tag, makes for a pretty compelling combination. But is it enough to ensure that Barnes & Noble will have a winner on its hands for the holiday? Find out after the break. 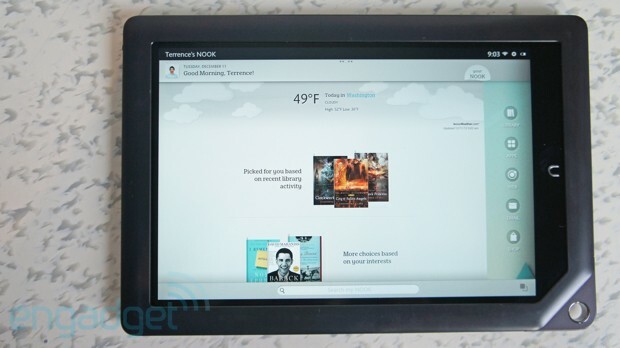 With the Nook HD+, Barnes & Noble is offering a nice piece of hardware at a good price. Too bad it's somewhat limited on the software side. How would you rate the nook HD+? The Nook Color was a strange-looking thing: long and plasticky, with a prominent carabiner embedded in one corner, serving no purpose other than aesthetic distinction. It was a polarizing choice, heralded by some as a break from the millions of samey slates that have saturated the market, and dismissed by others as just plain. Barnes & Noble clearly felt strongly enough about the design to keep it in place for the follow-up Nook Tablet, making no major aesthetic alterations to the device, save for brightening the body up a shade. With the Nook HD, the company eschewed that distinctive design for something a touch more straightforward but even so, the past strongly informs the design here. At first glance, the new tablet is a dead ringer for its predecessors: a long rectangular slate, with prominent bezels encasing the display. 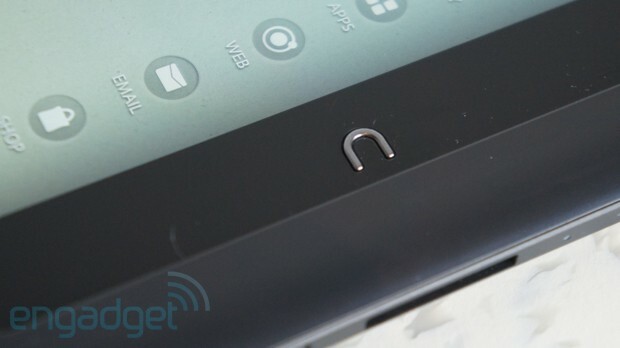 Along the bottom of the screen, a flush black space houses the familiar lowercase "n" home button that's long been a mainstay on Nook devices. The company went to some lengths to polish the appearance, employing Simple Touch designer and former Apple employee Robert Brunner to rethink the tablet -- good news, given how the Nexus 7 and Kindle Fire HD have been raising the bar for budget tablets. The most obvious change is the abandonment of the carabiner in favor of a small hole on the bottom-left corner -- sort of a vestigial remnant from past models. 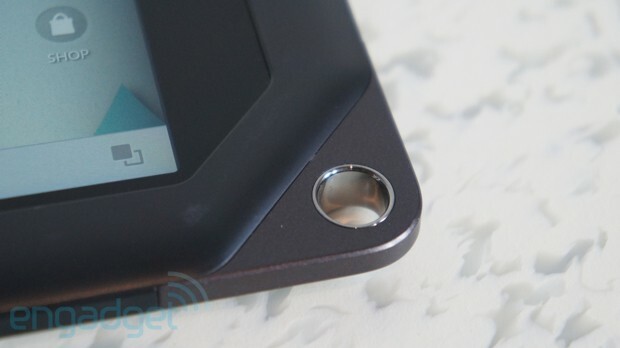 The biggest side effect to this redesign is the location of the microSD slot, which now sits on the bottom edge. Using that, you can expand the built-in 16 / 32 gigs by up to 32GB. Just to the left is the proprietary charging port, which is frankly a bit of a bummer as it moves away from the more universal micro-USB of other Nooks in favor of faster charging, according to Barnes & Noble -- though the more ubiquitous choice is certainly sufficient for much of the competition. 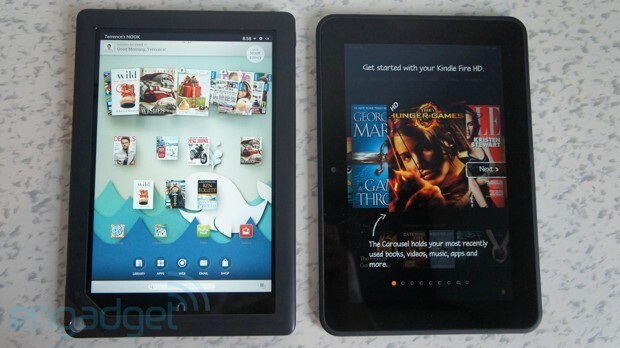 The new Nook is also significantly larger than the Tablet (9.5 x 6.4 inches vs. 8.1 x 5.0), a byproduct of expanding the screen from seven to nine inches. All told, the size increase suits the Nook. For one thing, that well-pronounced bezel is more spread out, and doesn't monopolize nearly as much of the device's front face. The increased surface area has also made it possible to shave a few fractions of an inch of thickness, down to 0.45 inch. Naturally, too, the larger size has added a bit of heft to the device, which weighs 18.2 ounces, compared with 14.1 for its predecessor. Still, that's lighter than the 20-ounce Kindle Fire HD 8.9. It's important to note, of course, that the purpose of the Nook HD+'s unique design isn't just difference for the sake of being different. As with other Nook devices, there's an emphasis on function over form. The rounded corners and large bezels conform more nicely to the hand than the equivalently sized Kindle Fire (the lighter weight definitely helps as well). As with the smaller Nook HD, we wish the company borrowed a page from the Simple Touch by including a concave back where users can rest their weary fingers. Instead, Barnes & Noble opted for a simpler approach. 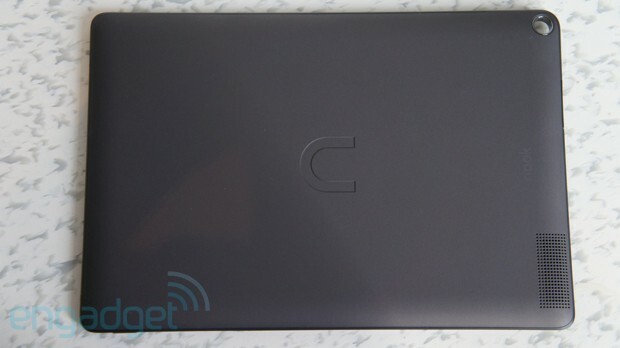 The back of the tablet is covered in a nice, textured soft-touch material, with the customary engraved "n" logo in the center. There's a pair of stereo speakers hidden behind a single grille at the bottom of the device's rear. The positioning leaves something to be desired, particularly compared to the latest Kindle Fire, which has dual-grilled speakers flanking the rear cover. The sound, too, is nothing to write home about: it gets reasonably loud, but sounds fairly tinny. You're likely going to spend a lot time using the headphone port located next to the volume buttons atop the device. As with its smaller sibling, Barnes & Noble opted not to include any cameras on the HD+, which amongst other things, helped keep the price down a bit. But again, it's hard to justify totally skipping the feature at this point and time -- for something that's so family-focused, VoIP capabilities seem like a no-brainer. The killer feature, of course, is the display. With 1,920 x 1,280 resolution and a pixel density of 256 ppi, it edges out the Fire HD 8.9's 1,920 x 1,200, 254-ppi screen, and certainly trumps the Nook HD's 1,440 x 900, 243-ppi panel. It also handily beats the iPad Mini's 1,024 x 768, 163-ppi screen. Not too shabby for a $270 tablet. The company's still got some work to do on its movie offers, but, at least from a display standpoint, this is a compelling and compellingly affordable multimedia option. The 1.5 GHz dual-core OMAP 4470 also offers a bit of a bump from the Nook HD's 1.3GHz version. The home page is a mostly clean slate, where you can easily access your favorite content and apps. Toward the top, there's a carousel of recent content -- not unlike the one that serves as the centerpiece for the Fire experience. Perhaps they just haven't been updated for this particular display, but many of the thumbnails of content that came with our device look fairly low-res. Icons at the top of the thumbnails denote the newest selection and the ones that are located in the cloud. Above this, you'll find a friendly welcome note, the date and time, and icons for WiFi settings and battery life. Clicking "Your Nook Today" brings you to a page that offers up the local weather and content recommendations. Toward the bottom, you get buttons for visiting your library, apps, the web browser, email and the Nook shop. Below this is a field for searching the Nook. As with its predecessors, the HD+ doesn't offer up access to the whole of Google Play. Barnes & Noble insists that you'll have all the apps you could ever possibly want -- and certainly the company loaded us up with a good spread, including Spotify, Pandora, Hulu Plus, Flipboard and Bad Piggies -- but it's still hard to justify a walled-off app store experience on Android at this point, particularly as the device's relative openness is one of the of the more prominent aspects that sets the tablet apart from the Fire HD. As with the rest of the software, the content experience is pretty much what you're getting on the smaller Nook HD. The primary difference here is the display you're using to consume that content. Interestingly when the company first announced the HD+, it mentioned magazines as an instrumental factor in its design to push toward the larger form factor. It seems like an odd thing to put at the center of a device; it's tough to imagine anyone plunking $270-plus for a magazine reader, particularly one that's of no use to you the first several minutes of a plane ride. That said, this truly is a nice product for diving into an image-rich magazine. Images really pop on that 1,920 x 1,280 display, and reading feels quite natural when you're holding the device in portrait mode. Flip to turn the page and you get a nice little curl animation. You can zoom in with a pinch and if you zoom out enough, you'll get a nice layout of the issues in thumbnails. Tap the bottom of a page and you can view it as a scrollable gallery. Flip the device into landscape and you can read it a page spread at a time. It's a really nice way to read magazines. Ditto for comics, which offer up a similar experience, along with the "Comic View," allowing you to focus on a few panels at a time. Barnes & Noble's also put some focus on catalogs, if the whole shopping on a website thing isn't your bag. Catalog browsing carries over a number of elements from the magazine UI, coupled with hotspots that bring you to product pages -- seems a bit of a roundabout way to do online shopping, but to each his own, right? Also, unlike the comics and magazines, the L.L.Bean catalog that came preloaded wasn't formatted to the display and suffered from severe letterboxing. The large display is also a compelling proposal for B&N's excellent interactive children's book offerings, serving big, bright picture books well. This, coupled with the parental control profiles the company introduced this go-around to help parents monitor content, provide two solid arguments for considering the new Nook Tablets as a low-cost, kid-friendly tablet. As far as plain, old-fashioned books go, however, you're not getting much of a bonus from the increased screen size. You've got more real estate for words here, which could certainly be to the benefit of those with poor eyesight, but really, the seven-incher is an ideal size for reading straight text (and, really, if that's your main need, you should look seriously at a devoted e-ink device like the Simple Touch or Kindle Paperwhite). The extended display size does, however, make a big difference on the movie front. Coupled with the high-res display, watching movies is a really nice experience on the HD+, and as promised, the company's continued to roll out a slew of content on the Nook Video with a number of high-profile movies and shows (like Brave, 21 Jump Street and Game of Thrones) having been added along with UltraViolet integration since we checked out the smaller version. 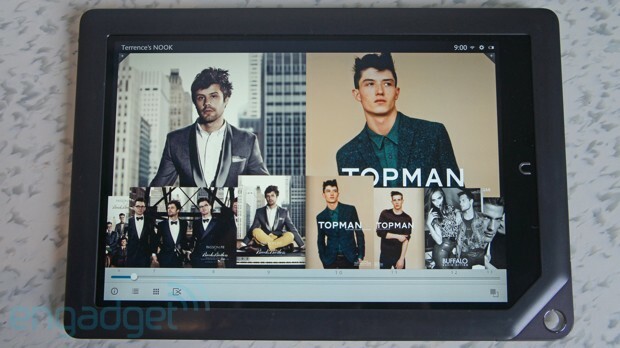 The Nook HD is a solid 7-inch tablet, and its 9-inch counterpart is a pretty good thing in its own right. The software still leaves a bit to be desired, between a staid UI and a limited app selection. (Then again, that built-in microSD slot means hacking the thing is always an option.) From a hardware perspective, however, it's pretty tough to argue with a 1,920 x 1,280 display on a $269 / $299 device -- particularly one that's so comfortable to hold. Magazine and comics fans will find a lot to like here, and as the company builds out its movie offers, it will become an even more compelling device for multimedia consumption. Parental controls, kid's content and the low price point, meanwhile, offer up a temping proposition for families. All told, the Nook HD+ isn't likely to burn up the holiday charts like the Kindle Fire HD or iPad mini, but we definitely wouldn't mind finding one in our stocking this season.